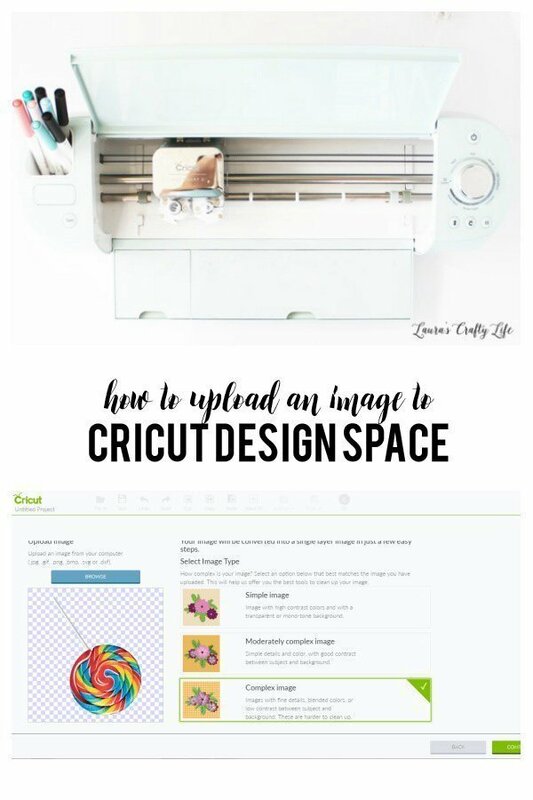 Today I am going to share with you how easy it is to upload an image to Cricut Design Space. This is one of the features I love about my Cricut. I can use any image I download to my computer and create with it. I often use this technique with word art I create in Photoshop. For my daughter’s Shopkins birthday party I created some party favors to hand out to all the guests. I wanted to dress up a plain lollipop with something more specific to the Shopkins theme. 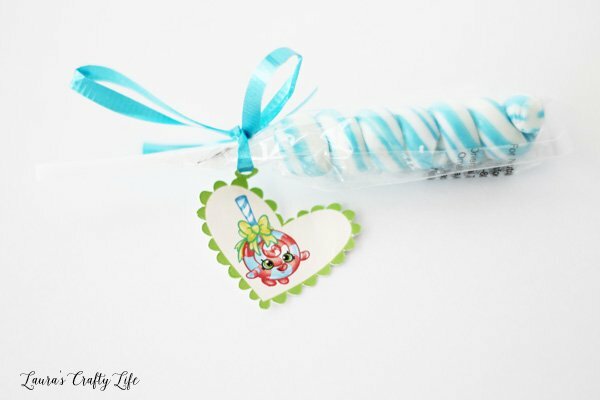 So I created little heart tags to attach to the lollipops using the Lollipoppins image I found on the Shopkins website. The first thing you want to do is open Cricut Design Space. Then, click on FILE. Then NEW. 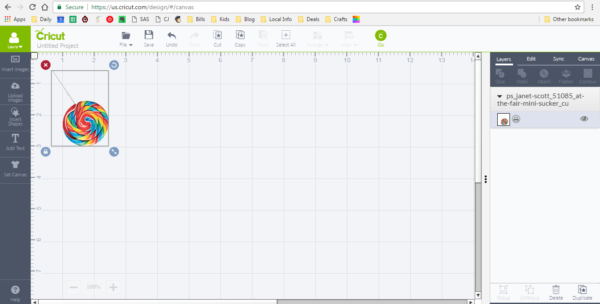 Once your new project mat has opened up, click on the UPLOAD IMAGES tab on the left side. You can use just about any type of image that you want – a .jpeg, .svg, .png and more! Click on UPLOAD IMAGE. Then click BROWSE. Note: You cannot upload a .pdf. Many free printables online are PDF files, so be sure you check your file type before trying to upload an image. It will open up your files on your computer. Navigate to where your file is stored, find the image and click OPEN. You can test out which type of image you are working with. This one looks the best with COMPLEX IMAGE selected. When working with a .png file you usually don’t have much to clean up on the image. When uploading a .jpeg image you will often have a white background you need to remove before saving your image. Note: You can also crop the image. If you want to be more specific about what you are erasing you can use the ERASE tool rather than the SELECT and ERASE tool. This allows you to erase just a little part of your design rather than an entire section. Once you have the image looking exactly as you would like it to, click CONTINUE. Note: Please be sure you are not violating any type of copyright regulations. In general, most images are okay to use for personal use. However, sometimes this is not the case. If you have a question about whether you are allowed to use an image, please contact the owner of the image. And if you are using the image for commercial use – in an Etsy shop or you are selling a product, be sure you have the proper licensing to be able to do that. For this reason, I am sharing a different lollipop than the one from the Shopkins website in my tutorial. Decide if you are going to save the image for a PRINT THEN CUT or a SAVE AS A CUT image. You can see if you save it for cutting it will only save it as an outline. This is usually the option I choose when working with word art. However, for this image, I want to be able to see all the details and colors of the lollipop, so I will save it for PRINT THEN CUT. Then click SAVE. Helpful Tip: This is the time to add tags to make it easier to search for your image later. For this lollipop, I will add the words lollipop, circle, and rainbow. Now you can click on the image, and then INSERT IMAGES. 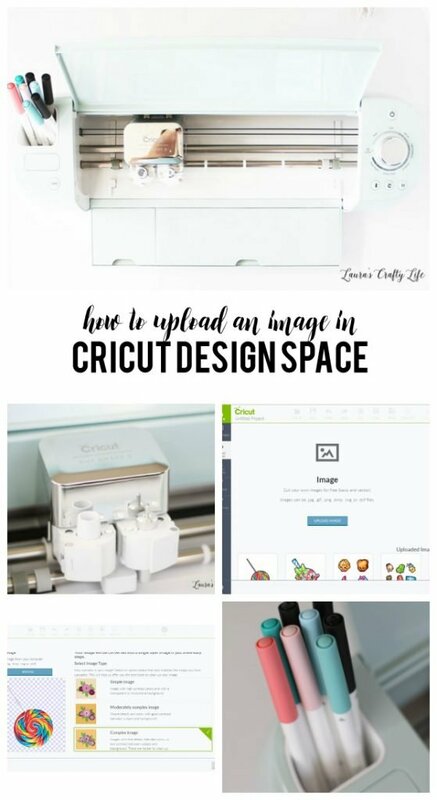 You can now work with your image like any other image you would use in Cricut Design Space. Below you can see a video I created walking you through this process step by step. It also shows how I assembled the lollipops for the favors. I used a similar process to create the stickers for the tops of the bubbles and the cut-out images of the SHopkins for our scavenger hunt game. This was an easy way to print out these images and cut around them without having to hand cut each and every one with scissors.